The Earthquake-Induced Landslide Hazard Map shows areas’ susceptibility to landslide caused by earthquakes. Hazard classifications are: High Susceptibility, Moderate Susceptibility, Moderate Susceptibility, Low Susceptibility, Not Susceptible, and, Possible landslide depositional/affected zone. The susceptibility is determined by simulating the largest possible earthquake magnitude occurring in the area. Landslide potentials were calculated using: A.) the computed Factor of Safety (FoS); B.) simulated ground shaking by Fukushima and Tanaka; and, C.) critical acceleration of slope by Newark methods. The result shows the possible landslide initiation zones at varying degrees, i.e., high, moderate and low. Hatchured areas show the possible depositional extent of land slide materials and is considered part of the areas that may be affected by landslides. 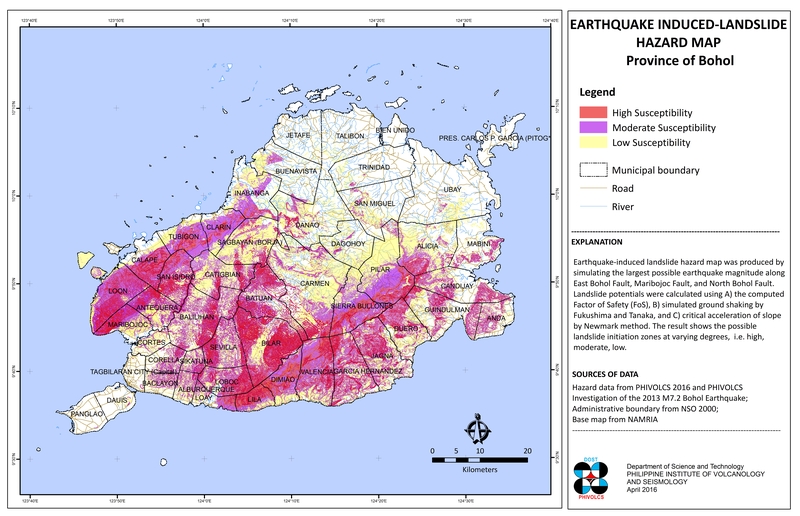 The Earthquake-Induced Landslide Hazard Map is acquired in JPG from the Hazards Mapping and Assessment for Effective Community-Based Disaster Risk Management (READY) Project through the Philippine Institute of Volcanology and Seismology (PhIVolcS). Information sources are as follows: Hazard Data is generated by PhIVolcS, Administrative Boundaries are from National Statistics Office (NSO) 2000, and Topographic Map 1:50,000 scale from National Mapping Resource and Information Authority (NAMRIA). 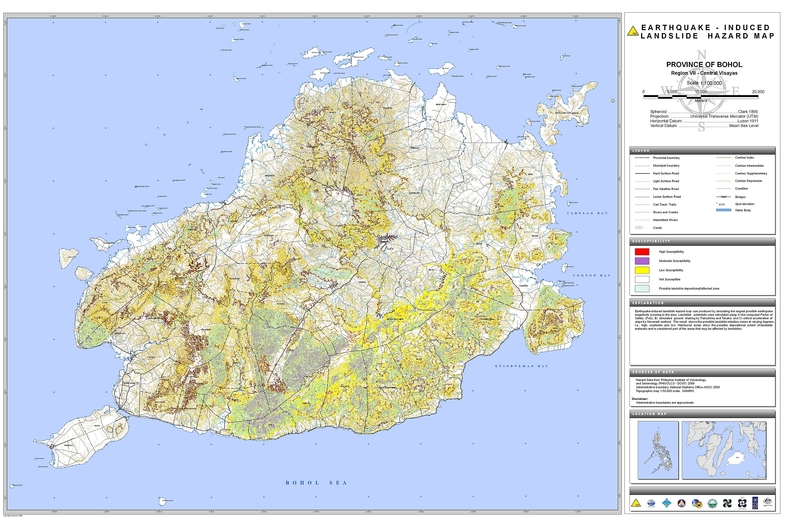 Available in JPG and PDF, this map may be downloaded and used for free provided that: a.) no alterations are made to the map; b.) proper citations be referred to the sources mentioned above; and, c.) all logos appearing on the map should also appear on your document. sir asa ta kakuha uh ship file sa earthquake induced landslide hazard map? pwede ta makapangayu ug naay inyuha? thanks. 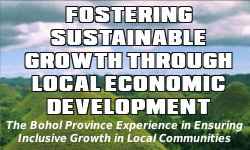 Hi Crisnil, we do have the shapefiles available for download under the Shapefiles sub-page of the Provincial Atlas. It was based on the files we extracted from the REDAS Software used during the REDAS training of the Local Planners on July 2009. Unfortunately, we can’t share the shapefile of the updated Earthquake-Induced Landslide due to restrictions by PHIVOLCS. However, I think you can ask PHIVOLCS for the shapefiles for your organization’s use… I believe, for the PNP?